On Sunday evening, December 6, 2015, President Barack Obama delivered the third Oval Office address of his presidency. In the wake of the San Bernardino shooting, he attempted to ease the minds of Americans shaken by the threat of ISIS and the bloody terrorist attacks, both domestic and international, that have taken so many lives in recent months. It was 2010 the last time Obama spoke to the nation from this symbolic space, one reserved for especially urgent speeches. That he chose to address United States citizens from the Oval Office tonight emphasizes the gravity his administration has placed upon the fight against ISIS. However, the president maintained his familiar equanimity as he transitioned into his plans to protect the nation. The president organized his speech into three sections, first delineating what his administration will do to ensure America’s safety, then listing steps Congress should take to aid in counterterrorism efforts, and finally concluding with remarks on what we must as a country avoid in order to play into the narrative ISIS has spun about the United States and western culture. The president noted that 65 countries have joined an American-spearheaded coalition in order to engage in counterterrorist efforts. 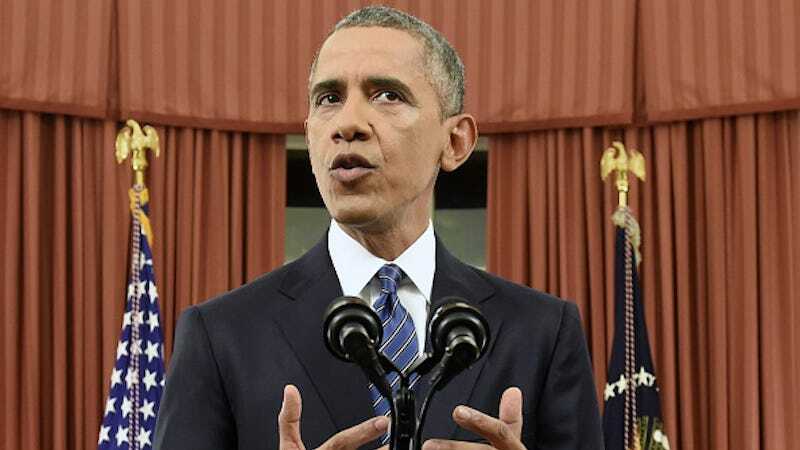 Finally, as he began discussing what we must avoid in these antiterrorism efforts, Obama asserted that we must not become entangled in a “long and costly” ground war in Iraq and Syria. This, he explained, is precisely what ISIS wants — a way to draw out combat on their soil, killing more and more of our soldiers in the meantime. Although Obama averred that Muslims must “confront without excuse” the extremist ideologies being touted in the name of Islam, he noted that it is the “responsibility of all Americans of every faith to reject discrimination.” We must see Muslim communities as “allies” in this fight rather than to conflate them with the brutality of ISIS. “Muslim Americans are our friends and our neighbors, our coworkers, our sports heroes, and yes, they are our men and women in uniform who are willing to die in defense of our country. We have to remember that,” Obama said. Hillary Clinton has not posted a response to her Twitter account at this time.